Canada’s National Anthem being performed before the last Labour Day Classic at Ivor Wynne Stadium. Even though the Toronto Argonauts defeated the Hamilton Tiger-Cats in a shocking fourth quarter comeback, the final Labour Day Classic at Ivor Wynne Stadium was a game to remember not only for it’s dramatic ending, but also from the overall Labour Day experience that’s never failed to disappoint. 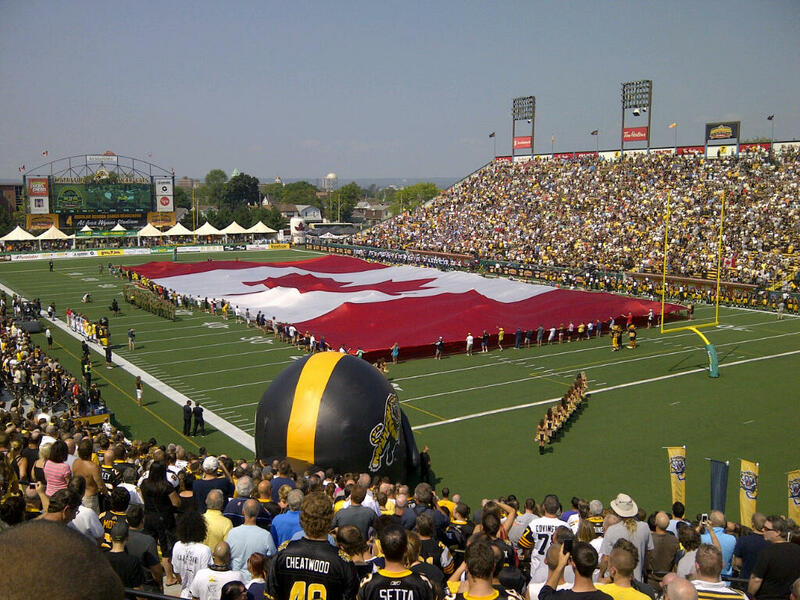 The Labour Day Classic at Ivor Wynne Stadium is known around the league as one of the most intense, important, and hotly contested games of the regular season. Toronto Argonaut players hate it, Hamilton Tiger-Cat players love it, and just about everyone in Hamilton wants to be there for it. Scott Park, which is located across the street from the south side of the stadium, was over-capacity with tailgaters consuming their fair share of alcohol and sausages hours before kick off. The atmosphere surrounding the stadium before the game was almost celebratory, with a cheerful crowd passing the turnstiles, ready to absorb every second of a famous last game. Ivor Wynne Stadium is a relic; a stadium of times past; a reminder of better days in The Hammer, when jobs were in abundance and industry was booming. Previously named Civic Stadium, it’s inception was in 1928, ages before modern monolithic, boring stadiums. With wood seating, pillars blocking fans views in some sections of the south side, and no variety of concessions, it’s easy to see why management is so eager to see a new stadium erected in it’s place. Most Tiger-Cat fans, however, would disagree. The stadium is sandwiched between Melrose and Balsam Avenue in East Hamilton, where many would call the “heart” of the city. Parking is scarce, so often you find yourself parking on the driveways and lawns of residents (thankfully, my grandfather lives a block away and always saves a spot on his front lawn for me) within the areas surrounding the stadium. If you’re taking the HSR, you get a free shuttle ride upon brandishing your ticket as the city increases the transit schedule for the additional ridership the game brings. In an unexpected twist, the halftime show was the Syracuse University Orangemen marching band. They were seated in section 21 during the game (directly behind where I was seated – awesome!) and were a great boost to the home fans, performing Hamilton chants and classic marching band songs in-between plays. Needless to say, they overshadowed the traveling Toronto Argonauts band, “The Argonotes”. A perfect day was only mildly disrupted by a tough loss. But one thing is for certain, it’s going to be a very sad day when this stadium is torn down. Many memories were made here, over several generations. It will be interesting to see how the new stadium will turn out, however. Will they change the stands from North-South to East-West? Is there going to be more than just beer and hot dogs? And will the citizens of this passionate city accept their new mecca? Bring on 2015 and the new Labour Day traditions that will follow. Us Tiger Cat fans are hungry for more.